Have you ever wanted to run SQL queries on Amazon DynamoDB tables without impacting your production workloads? Wouldn't it be great to do so without needing to set up an ETL job and then having to manually monitor that job? In this blog, I will discuss how Rockset integrates with DynamoDB and continuously updates a collection automatically as new objects are added to a DynamoDB table. I will walk through steps on how to set up a live integration between Rockset and a DynamoDB table and run millisecond-latency SQL on it. The first time a user creates a DynamoDB-sourced collection, Rockset does an entire scan of the DynamoDB table. After the scan finishes, Rockset continuously processes DynamoDB Streams to account for new or modified records. To ensure Rockset does not lose any new data which is recorded in the DynamoDB table when the scan is happening, Rockset enables strongly consistent scans in the Rockset-DynamoDB connector, and also creates DynamoDB Streams (if not already present) and records the sequence numbers of existing shards. The continuous processing step (step 2 above) processes DynamoDB Streams starting from the sequence number recorded before the scan. Primary key values from the DynamoDB table are used to construct the _id field in Rockset to uniquely identify a document in a Rockset collection. This ensures that updates to an existing item in the DynamoDB table are applied to the corresponding document in Rockset. For this example, I have created a DynamoDB table programmatically using a Hacker News data set. The data set consists of data about each post and comment on the website. Each field in the dataset is described here. I have included a sample of this data set in our recipes repository. The table was created using the id field as the partition key for DynamoDB. Also, I had to massage the data set as DynamoDB doesn't accept empty string values. With Rockset, as you will see in the next few steps, you don't need to perform such ETL operations or provide schema definitions to create a collection and make it immediately queryable via SQL. I will use the Rockset Python Client to create a collection backed by a DynamoDB table. To try this in your environment, you will need to create an Integration (an object that represents your AWS credentials) and set up relevant permissions on the DynamoDB table, which allows Rockset to perform certain read operations on that table. 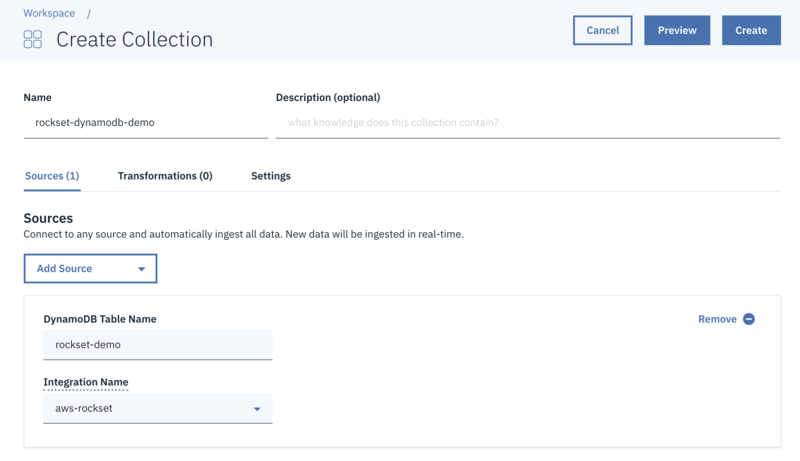 Alternatively, DynamoDB-sourced collections can also be created from the Rockset console, as shown below. Each document in Rockset corresponds to one row in the DynamoDB table. Rockset automatically infers the schema, as shown below. Now we are ready to run fast SQL on data from our DynamoDB table. Let's write a few queries to get some insights from this data set. Since we are clearly interested in the topic of data, let's see how frequently people have discussed or shared about "data" on Hacker News over the years. In this query, I am tokenizing the title, extracting the year from the the time field, and returning the number of occurrences of "data" in the tokens, grouped by year. Using Apache Superset integration with Rockset, I plotted a graph with the results. 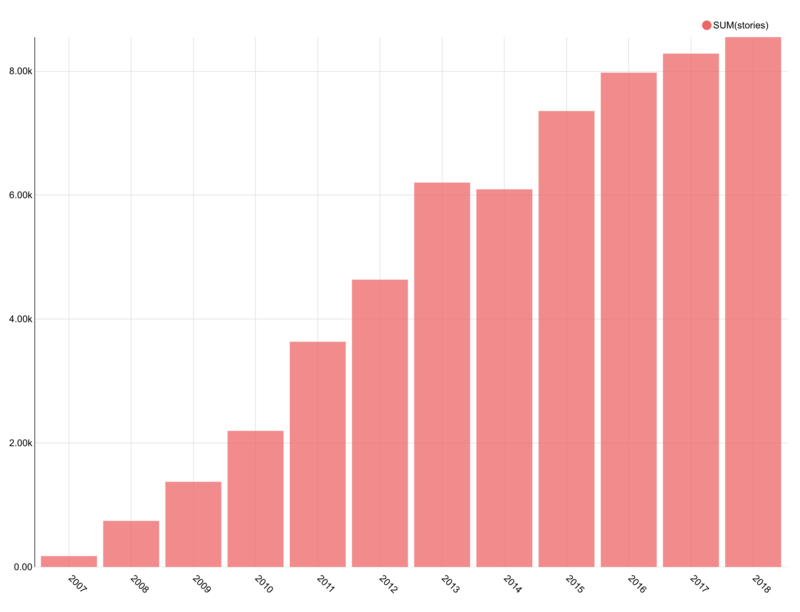 The number of stories concerning data has clearly been increasing over time. Next, let's mine the Hacker News data set for observations on one of the most talked-about technologies of the past two years, blockchain. Let's first check how user engagement around blockchain and cryptocurrencies has been trending. As you can see, interest in blockchain went up immensely in 2017 and 2018. The results are also aligned with this study, which estimated that the number of crypto users doubled in 2018. Also, along with blockchain, hundreds of cryptocurrencies emerged. Let's find the most popular coins in our data set. Bitcoin, as one would have guessed, seems to be the most popular cryptocurrency in our Hacker News data. In this entire process, I simply created a Rockset collection with a DynamoDB source, without any data transformation and schema modeling, and immediately ran SQL queries over it. Using Rockset, you too can join data across different DynamoDB tables or other sources to power your live applications.